How Do I Install Crystal for Chrome? Download the Chrome Extension on the Chrome Web Store. 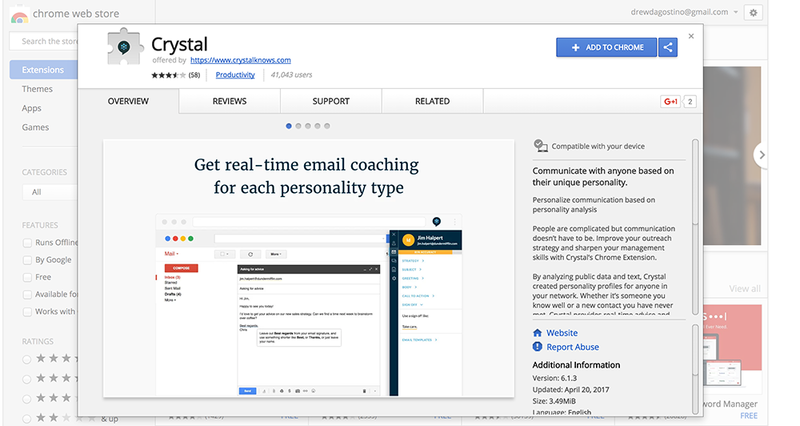 Installing our Chrome plugin and getting access to personality profiles all over the web is easy. To install the plugin, navigate to our page in the Chrome Web Store. Click "Add to Chrome" and then "Add Extension". When you add Crystal for Chrome, it’ll pop up some permissions that the app requires. If you’re on LinkedIn or other social media and try to pull up a profile, we’ll read the page URL to search for a profile. If we don’t have one, we’ll try to read the page to generate one. When we embed our button on social media and tools in Gmail, we are modifying data on the page. We do not read or store any of your personal information or communications anywhere on the web. Congratulations! You’ve installed our Chrome Plugin. You’ll know you’re successful when you see the Crystal logo in the upper right-hand corner of Chrome.